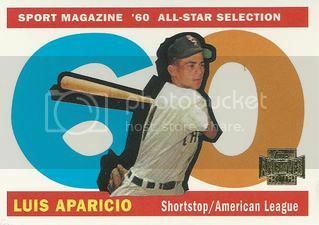 I don't have anything new scanned so I figured today was a good day to throw out a random Luis Aparicio card. This one is from the 2002 Topps Archives set. I miss the old Archives sets. You know the ones that only had retired players in them? They gave us glossy versions of classic cards like this Lil Luis All-Star card from 1960. Good stuff all around. I've wanted this card for five years but never pulled the trigger. For the past year or so I've been waiting for another one to pop up on eBay at a decent price. This card came up last week and was labeled as being from the "2007 Topps Archives" set instead of Heritage. I'm not sure if that helped keep the price lower but I got this for just over $26 so I was happy. I'm usually a pretty low end collector so there aren't many cards I've ever spent over $20 on. That's what has always prevented me from getting any of the Lil Luis autos from any of the Heritage sets. The 1958 Topps / 2007 Heritage set is probably my all-time favorite card design so this is the one I had to have. I'm glad we finally got it. 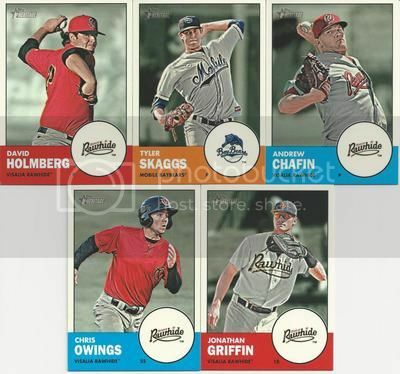 The 2012 Topps Heritage Minor League set came out last week. It's the second year they've done a minor league version of Heritage. I like both of them and hope Topps continues with this line. I grabbed five out of the eight cards from the Diamondbacks team set. I have Andrew Chafin, Jonathan Griffin, David Holmberg, Chris Owings, and Tyler Skaggs. I'm missing Archie Bradley, Raywilly Gomez, and Anthony, Meo plus Matt Davidson who is an SP. If you have an extra one of those guys, I'd be happy to take it off your hands. 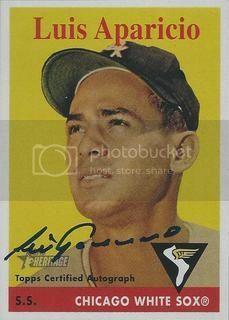 Friend of the blog, Brain, sent over two cards for our Luis Aparicio collection. You may know Brian from his blog 30-Year Old Cardboard. The second is from the 2000 Fleer Greats of the Game set. I want to say this is my favorite design from the different Greats of the Game sets but it's really hard to choose. They're all so amazing. Thanks again, Brian. You always come through with the best stuff. The first is from the 2009 Topps Ring of Honor insert set. 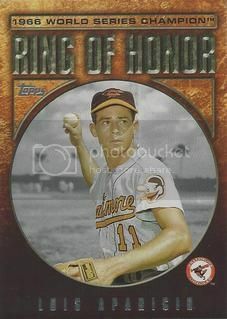 It remembers Lil Luis and the 1966 Baltimore Orioles. I really like this set. It had a nice simple design and a big checklist. Thanks, Brian. This card is great. I recently won a lot 17 different of Detroit Tigers season tickets. These are pretty cool because they're all from 2008 and were made in the design of 2008 Topps cards. I figured they'd fit in nicely with the rest of our collection. The seventh is from July 25, 2008. It features Tigers manager, Jim Leyland. In case you were wondering, the White Sox beat the Tigers 6-5. Jermaine Dye hit a two run home run in the ninth inning to put the Sox ahead. 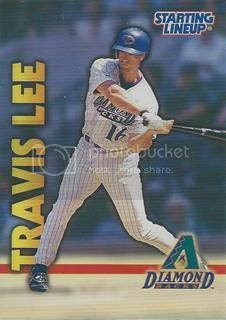 There was only one card that I really wanted to get signed at the Diamondbacks Alumni Game. It was Mike Hampton's 2008 Topps card. 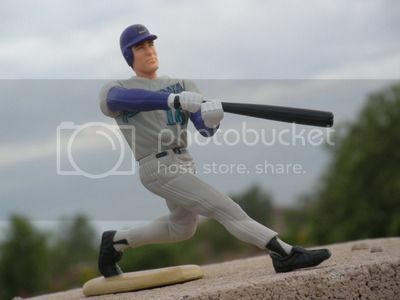 Most people probably don't even remember that Mike was on the D-Backs. He was only on our team for a little over a month in 2010. I remember Mike's time in Arizona because on September 4th of that year, my dad and I took my son to his first ever D-Backs game. Before the game Mike signed autographs all the way down the third base line. We had tickets a few rows up and the whole time I was sitting there kicking myself for not bringing his 08 Topps card with me. I've thought about that day everytime I stumble across this card. After a few years of waiting, I finally got Mike to sign that card. It's the 498th for our set. Right now you're probably thinking, "Dude, wasn't your last post on this same card???" It's not often that anyone would have a reason to show the same card in two consecutive posts but the autograph gods shined down on me at the Diamondbacks first ever Alumni Game on Saturday. A few innings into the game, my wife wanted to go to the upper deck to visit her friend who was also at the game. I reluctantly agreed. We got on one of the elevators and right behind us comes Brandon Webb. I pulled out my 2010 Topps Heritage jersey card and Brandon signed it nicely in blue Sharpie. I was pretty stoked. Some people would say that you can't get much for a $1.25 these days. 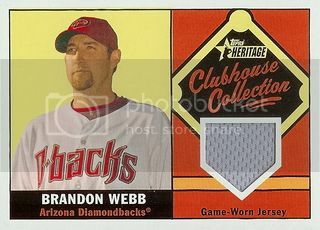 Well that's exactly what I paid for this 2010 Topps Heritage jersey card of Brandon Webb with free shipping. I remember the good old days when Brandon was picked for the All-Star team three consecutive years and when he won the Cy Young award in 2006. Since then injuries have caused him to pretty much fall off the face of the earth. He'll be making an appearance at Chase Field tomorrow as part of the D-Backs first annual alumni game. I'll be there too. I'm not sure exactly what to expect but it should be a good time. We sent Joey Votto an autograph request last year and a few months later our card came back to us signed. This one's been in the queue for a future blog post for awhile. If I remember correctly, we've had it since about April. A nice return from the 2010 National League MVP. The sixth is from September 3, 2008. It features former Tigers closer, Todd Jones. In case you were wondering, the Tigers beat the Angels 9-6. Placido Polanco lead Detroit's offensive charge by driving in three runs. 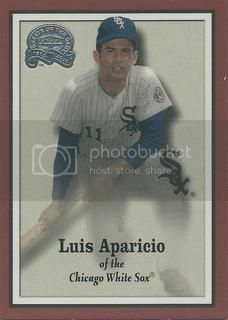 Check out this Luis Aparicio bat card from the 2009 Topps Sterling set. Pretty cool, right? It's got a nice pic of Lil Luis, three pieces from a game used bat, and it's numbered to only 25. 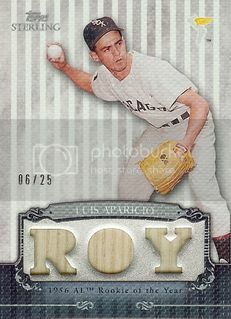 We didn't really start looking for relic cards for our Luis Aparicio collection until recently so we don't have many. Out of what we do have, this one's probably my favorite. About a year ago my dad gave my son a half dozen Starting Lineup figures for him to play with. He enjoyed them that day but they quickly were put aside for other toys. My son's been really into baseball recently and he's finally understanding how there are different teams. His favorites are the Cubs, the White Sox, and the Diamondbacks. He already had a Cubs and White Sox figure but when he asked for a D-Backs one I was a little stumped. My dad and I stopped collecting SLU's a few years before Arizona was awarded our ball club and I didn't have any D-Backs I could dig out for him. Like any good dad would do, I hit up eBay to see what I could find. For about $5 I grabbed this loose Travis Lee figure because it included the trading card. Now I did feel a little strange buying a Starting Lineup again when we have boxes of these things in storage but the little dude was happy so it was worth it. We've been playing "baseball guys" all weekend. I often find myself approaching eBay like one of those guys on Storage Wars. If I see a card going for less than I think it's worth ( even if it's something I have no interest in ), I'll throw in a bid just to help drive up the price. 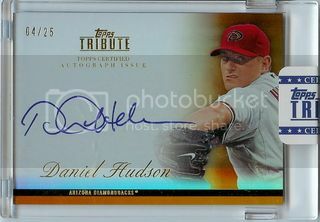 I didn't really intend on winning this Daniel Hudson certified autograph from the 2012 Topps Tribute set. I already have the regular version that's numbered to 99. That was good enough for me but I saw this orange version numbered to 25 going too cheap. I threw in a modest bid of $6 with no thought of actually having a chance at winning this thing. When all was said and done this beautiful card was home where I guess it belonged all along in my Daniel Hudson collection. A great steal for just under $8 shipped. It's Free Shipping Friday and I'm still on the lookout for any good deals on eBay that come with free shipping. 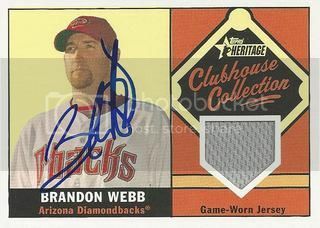 Today's edition brings us a nice card for our Diamondbacks collection. 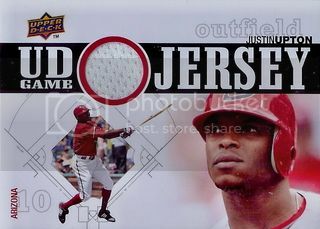 This Justin Upton jersey card from the 2010 Upper Deck set cost us a whopping $1.04 with free shipping. Needless to say, I was happy. There's not too much left to look forward to this season for the Diamondbacks. With September call-ups happening this week, I decided to pick up a few cards of our top prospects. There's some good names here. Guys like Trevor Bauer, AJ Pollack, and Matt Davidson. 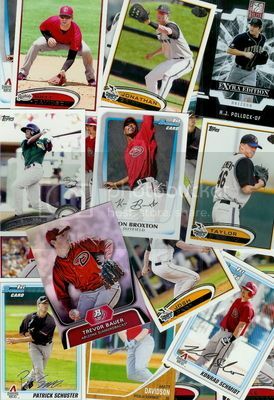 Plus a few I don't know too much about like Keon Broxton, Patrick Schuster, and Jonathan Griffin. Hopefully we'll see a few of these guys during Spring Training next year and we'll go home with a few extra autographs. Another D-Backs prospect made his MLB debut tonight. Outfielder, Adam Eaton was called up from Triple A Reno where he was absolutely crushing the ball. His .381 average was good enough to win him the 2012 Pacific Coast League MVP award. 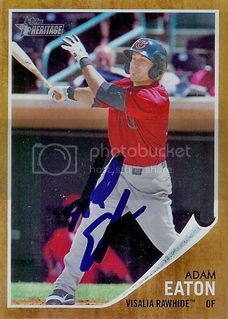 Adam signed his 2011 Topps Heritage Minor League card for us during Spring Training this past year. He seemed like a really nice guy. He was talking to all of the fans who asked for his signature. I had two copies of this card and Adam asked for the extra. I obliged and he gave it to a young fan. The Diamondbacks will be looking to find a way to get him playing time in our outfield next year. I'm pretty sure that means Gerardo Parra, Chris Young, or Justin Upton will be traded sooner rather than later. The fifth is from September 3, 2008. It features former Tigers infielder, Carlos Guillen. In case you were wondering, the Tigers lost 13-3 in a blowout to the Royals. Billy Butler crushed two home runs and drove in four. 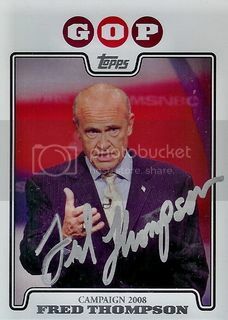 Former Tennessee Senator, Fred Thompson signed his card from the 2008 Topps political campaign insert set. This is the first one of these we've ever been able to get signed. I haven't really tried too hard or at all but I was happy to get this one back. I don't really know much about Senator Thompson but apparently his resume is quite extensive. He was even an actor on Law & Order appearing in over 100 episodes. 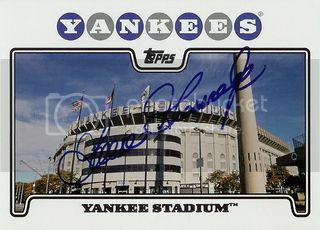 I acquired another Yankee Stadium card from the 2008 Topps 55 card Yankees Team set. The Yankees have a few living Hall of Famers I could have sent this one too. I already have this card signed by Whitey Ford so he was off the table. I decided to go with Goose Gossage. He's pretty reliable TTM when you send a reasonable donation to his charity. Goose didn't let us down. This rad card came back signed just a few days after we sent it. Thanks, Mr. Gossage! 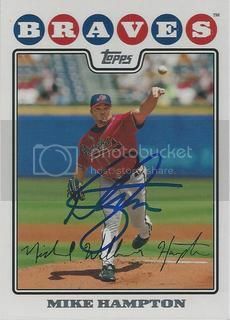 We got this signed Jose Valverde card from that guy on SportsGraphing.com who goes down to the Dominican Republic once a year. 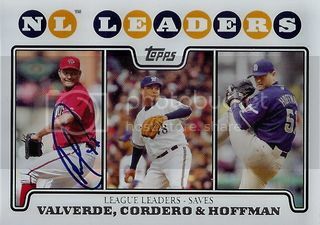 I'll probably try to get this League Leaders card signed by Trevor Hoffman next Spring Training but I'm not sure what to do about Francisco Cordero. Maybe he'll end up somewhere in the Cactus League. I won't be going too far out of my way to try to track him down.